Steph Paternot make a virtual fortune when the internet startup he co-founded in college, TheGlobe.com set records on its first trading day. But he and his company paid the price when his personal brand image as a brash young hard- partying entrepreneur pulled attention away from the business fundamentals. The cost to me, my personal brand. The cost to the Globe brand was, "Oh I see, we got a couple crazy dotcom CEOs. We maybe shouldn't trust them. You know, maybe they're too crazy." You're listening to Financial Grownup, with me, certified financial planner, Bobbi Rebell, author of How to Be a Financial Grownup. You know what, being a grown up is really hard, especially when it comes to money. But it's okay, we're gonna get there together. I'm gonna bring you one money story from a financial grownup, one lesson, and then my take on how you can make it your own. We got this. Hey Financial Grownup friends, how much thought do you give to your personal brand? To the images that you post on social media, or that are posted about you, with you in them, that you are tagged in? Do you think it impacts your career, or your future career, your business if you're an entrepreneur, your life? What would it have been like if social media weren't even around yet, and yet you were the one creating social media? It's very meta, but so is this whole interview, because I actually interviewed our guest who was the CEO of a company called theGlobe.com, the co-founder Steph Paternot back in the dotcom boom and bust. And I remember all the buzz that he got, it wasn't always focused on his company, a lot of it was on his personal life, on his clubbing, and even what he wore when he was out of the clubs. Kind of like many young adults who are in their 20s, that was a thing that people were doing at the time, he was quite normal, except most of those other 20 somethings, I'd say pretty much all of those other 20 somethings, were not worth close to $100 million on paper. Welcome everyone. If you are new, so glad you are joining us. We talk to high achievers here on the Financial Grownup podcast, they share unique money stories, and how we can learn from them, and also some every day money tips. Let's get to Steph Paternot, and the time that he and his co-founder, Todd Krizelman, were literally in college, and it should be noted that they did not drop out by the way, while they were building their company, theGlobe.com. Now they stayed in college specifically because it wasn't so clear that this internet was gonna be a thing, Steph actually said that. He really wasn't sure that the internet would be a thing that would actually be a thing. Alright, stay to the end to hear more about what Steph is up to now, he is disrupting a new industry, and I think you're gonna be very interested. Here is Steph Paternot. 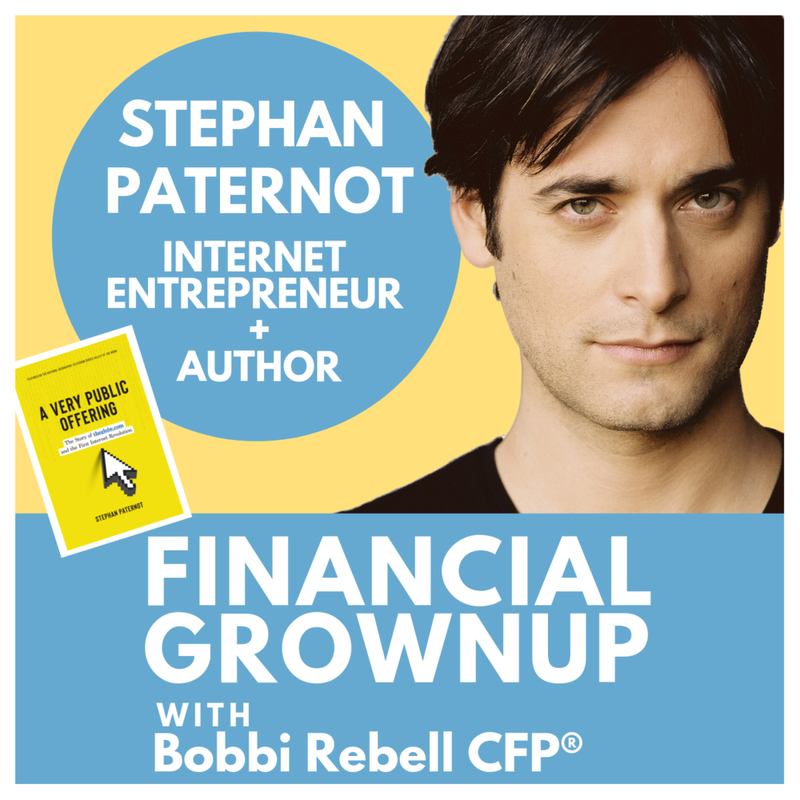 Hey Steph Paternot, you're a financial grownup, welcome to the podcast. I just finished reading the re-released, new and improved, version of your book, A Very Public Offering: The Story of Theglobe.com and the First Internet Revolution, it was a total page turner, and I'm glad it got re-released, in large part because of a new series that features you, and someone playing the part of you which we'll talk about, it's a little bit weird, National Geographic series, Valley of the Boom, which I am truly enjoying. So welcome. By the way, what was it like when you found out that they were casting someone to play you? Is that weird? Oh it was weird. I was shocked, because they had already engaged with me to come and participate in their documentary interview, and I'd already put in hours of being interviewed. In my mind it was nothing more than an expanded sort of news segment, or a documentary about the past. Since my current company, Slated, is in the film industry, I have a lot of film industry contacts, and the last thing I expected was to hear from film industry friends who were like, "Hey Steph, I just got this casting notice," I have friends who are casting directors and actors. Both parties were getting in touch with me saying, "Oh yeah so they're looking for a young, charismatic, actor to play a Steph Paternot, and another to play Mark Andreason, and a Todd Krizelman." And that's when I realized, "Oh my god I had just been pulled into something that I had no idea about." I gotta tell you Steph, your story doesn't need a whole lot of embellishment. And I'm excited about the money story that you're gonna share, because it has to do with personal branding, and the impact that can have on your financial success, or failure, of your company. And this all happened before social media was a thing. I mean you guys were inventing social media, and yet, this is kinda meta stuff I think. Tell us your money story. CNN decided to do a documentary on us, where they wanted to follow us, and see what the life was of a public company, dotcom CEO who's 24. And they followed Todd out to the Hamptons, where he had organized an impromptu badminton game, and a barbecue, and it was all very quaint. And then I decided, well I'll go show them what I've been doing when I need to let off steam," and that is to go clubbing, and why don't I kick it up a notch, and for once I'll wear these crazy vinyl black pants I bought, that'll make the story sexier. They also recorded me at my home, and one of the producers when I was off camera had asked me like, "Oh my gosh, so are you ready to live it up Steph now? I mean now that you're a billionaire are you ready to live it up?" And being that I'd grown up in England and I have a very sarcastic sense of humor, I just played along and said, "Oh yeah, absolutely, I'm ready to live a disgusting and frivolous lifestyle. That's the idea right?" And the filmed me going out to a nightclub and dancing on the tables. And I made sure really sort of to give them exactly the visual story I knew that would play well, and would be what their audience wants to believe about these dotcom days, and their juxtaposition of me dancing on the tables with this audio clip of me talking about a disgusting and frivolous lifestyle, they played that on CNN. I got so much [inaudible 00:00:00] from so many people, including my partner saying, "Why would you say that? Why would you do that." I was like, "Look this is all part of building the brand of the company, and living the life that they want to imagine we live." And by the way, not for nothing, but since this has been airing we've had tens of thousands more users sign up to our site. But the cost to me, my personal brand. The cost to the Globe brand was, "Oh I see, we've got a couple crazy dotcom CEOs, we maybe shouldn't trust them." People love to look for reasons when something isn't going well, of why it's not going well. And if you give the media, or if you give an audience one reason to dislike you, or to paint you with to say why everything's going badly, then you're doing yourself a huge disservice. So Steph what is the takeaway for our listeners? Be careful of taking your story, or over selling, or over dramatizing, or doing something like what I did, where you gave them a cool visual and a ridiculous piece of audio. And you're giving them something they can hit you on the head with later. And do you feel it hurt your finances? Did it hurt your ability to go back for more money, and other things? Did it hurt the image? It seems like it helped to drive users to your website, but there's two sides of the business that were going on. Yeah, so the truth is, is that if your business fails it's not because you once wore plastic pants on a T.V. show. If your business fails, that's what people will say, because it's just easy to paint people with ... the simplest character assassination is what people like to use. But the truth is, is if your business is failing, it's usually because either your customers aren't satisfied by the product, or your advertisers are fleeing, or there's not enough revenue in the market to cover the costs of your business and your infrastructure. So the reasons theGlobe failed, ultimately, have very little to do with one particular interview segment. That just simply gave people ammunition to become haters, and troll us. There's so many other factors that can bring down your business. I think the takeaway her is, stay focused on your business. For your everyday money tip, you wanted to talk about an acronym that I don't know even existed back in the day, FOMO, fear of missing out. FOMO, I think the term got coined in the late 90s, the fear of missing out, meant that you're operating often from a place of fear. If you're seeing everyone get rich quick because they're investing in dotcoms, well then you're gonna be apt to wanna quickly invest in anything with a dotcom as well, and you're gonna throw your money at a bunch of dotcom stuff. And for a while it's probably gonna grow, and you're gonna feel okay, until you realize that you had no clue what you were investing in. And when the market craps out, you go down with it. So you don't wanna invest ever because you're seeing everyone else getting rich from a particular area. By the way, that just happened in 2017 with the crypto space, right. Everyone was getting into ICOs, everyone was operating from a place of fear, if you don't invest you're gonna be poor, you gotta invest. Your latest venture, Slated, tell us more about that and the other projects that you have on deck. I decided every movie getting made shouldn't be a miracle. There should be much more a method to the madness of filmmaking. And there's probably a much more intelligent way that people in this industry should be able to find great projects, assemble teams, find financing, and execute on their vision. And I saw this occurring in the tech space, with marketplaces like AngelList, which were making it way easier for anyone to set up a startup, find talent, find financing, discover what the growth metrics were that were important, and really grow a successful business. And so we took the model of AngelList, we reinvented it for the film industry, and now Slated is the leading on-line film finance marketplace. Half of all the movies that have been nominated for Academy awards the last few years are made by Slated producers, directors, writers. And we're just increasingly getting those successful filmmakers to put their next films on Slated, and getting those financed. So it took me a long time to put my CEO hat back on, and to find my passions that married film, technology, the reinvention of money on-line, and marry those all together, and really take a shot again at building a company. Well congratulations on your success throughout the decades, because you really have had such an incredible run, and you're still just beginning with new projects. Where can people find out more? They can find me on Twitter, @stephanpaternot, or in Instagram @stephanpaternot, or on Facebook as Stephan Paternot. If only it was at theGlobe.com, oh what could have been Steph. But thank you so much, this was great. What an amazing story. Financial Grownup tip number one, you know that expression, "Dance like no one is watching." So freeing, so empowering, so not realistic in this day and age, because you know everyone's watching. Unfortunately you have to live like someone is watching. Like it or not, the lines are blurring between our work and personal, and something you think you do only amongst friends could be public faster than you can click post. Act appropriate. If you have a finsta, that's a fake Instagram, I get it. Just remember, it's still out there, and you just never know. Financial Grownup tip number two, if you fail, get up. Steph was down, ooh $100 million, yes it was all on paper, but it sure felt real to him. He has done so much since those days, and because he kept strong relationships with the investors that believed in him, he was able to start new businesses, new investments, and have new success. Keep an eye on Steph, and his film finance business Slated, I expect to continue to see big things, lots of disruption happening in that industry. Thank you for all of your support, of not just Financial Grownup, but my new podcast, Money in the Morning with Joe Saul-Sehy of Stacking Benjamins fame. Truly appreciate if you tell your friends, and subscribe to both. And big thanks to Steph Paternot for helping us all get one step close to being financial grownups. Financial Grownup with Bobbie Rebell is edited and produced by Steve Stewart and is a BRK Media production.